I've been behind in my book reviews, but my reading time has been cut short it seems lately. However I did find a chance to finish a few books at the end of summer. Lynette Eason's Called to Protect being one of them. Here's a blurb and we'll chat on the other side! I do love romantic suspense, and Eason has long been one of my favorite authors of the genre. 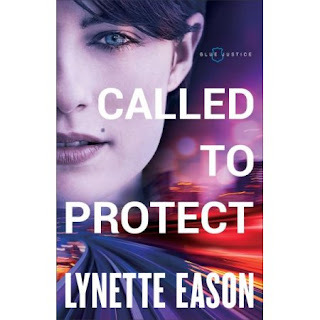 This is the second book of her Blue Justice series but you by no means need to read the first--though it will add to the depth and understanding of other characters in this book. I enjoyed the way this book touched on the topic of human trafficking. While portions of it seemed very authentic and needed to be brought into light, there were character moments that felt more author driven than authentic to the plot. Such as one young girl being rescued and then leaving safety to hop in the back of her abductor's truck. Though the author laid down reasons for this decision, I still struggled to fully believe them. That being said, the glimpse into a canine unit, the return to the St. John family, and the fast pacing of this book still pulled me through the pages. The first book in this series was my favorite, but this second one is a strong addition. I'll definitely read the third. I happily give Called to Protect 4 out of 5 stars.